Riva Casino is honestly a positive gaming experience that any veteran gamer would be happy to be a part of. With excellent games that bring comic books and Hollywood to online gaming in the best way, Casino Riva reveals other online casinos as the child’s playgrounds that they are. Though you certainly have to wait a period of time for downloads to get the full gaming experience available, Riva Casino is where you want to be playing. Welcome to the clubhouse where only the pros are allowed to play. That clubhouse is Riva Casino where professional game quality meets professional service to provide an online casino that’s only suitable for, well… professionals. Provided by software creator Playtech, gaming at Casino Riva is truly a quality experience. With over 280 games in their lobby, Riva Casino provides the complete gaming experience that any professional will expect. Though lacking the background music of most online casino lobbies that help set the social, gambling mood, Riva Casino’s lobby is inviting and easy to use with a background image of a brick and mortar that does its part in setting the scene. From here you can access the cashier, set your options, or open the Riva Casino games menu on the left side to get started with the gaming fun. The only downside to the games menu is how long you have to wait for downloads. After a full day, all of the games at Riva Casino will have downloaded and you can enjoy playing at your leisure, but be ready for long waits in your chair during that first day, when you’re so excited to give everything a try. In the games menu you’ll find a large selection of classic slots and themed video slots as well as all your favorite table games, video poker, and all kinds of different arcade style games to change things up a bit. Playtech is known in particular for their suite of video slots based on Marvel comics. 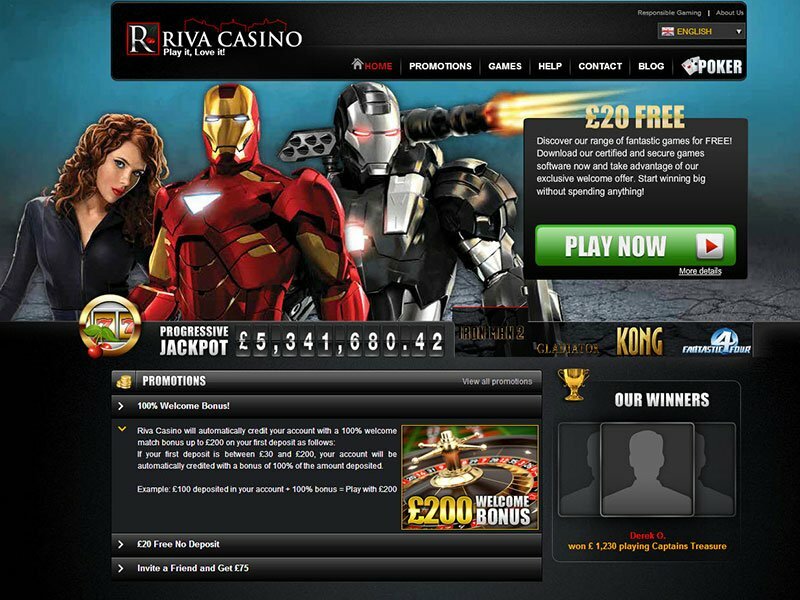 The hottest of these at Casino Riva include Iron Man 2 and The Incredible Hulk where good quality, unique special features and large jackpots wait to brighten up your day. In the games menu you’ll find a large selection of classic slots and themed video slots as well as all your favorite table games, video poker, and all kinds of different arcade style games to change things up a bit. Riva Casino relies heavily on their professional gaming services to bring in new customers and they could definitely stand to add some new Casino Riva bonuses to their list. 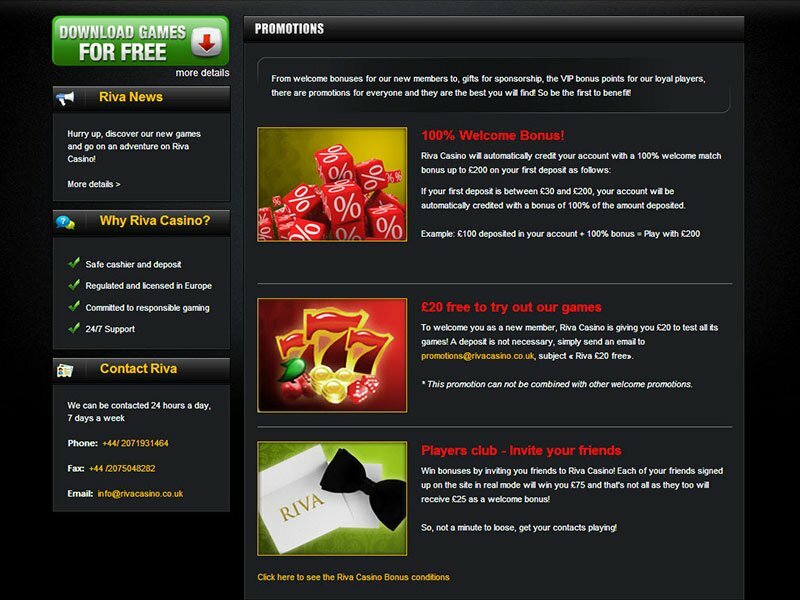 At the time of this Riva Casino review, a simple welcome bonus detailed that “If your first deposit is between £30 and £200 you will receive an extra 100% of your deposit free. In other words, this is a straight forward 100% Riva Casino bonus up to £100. 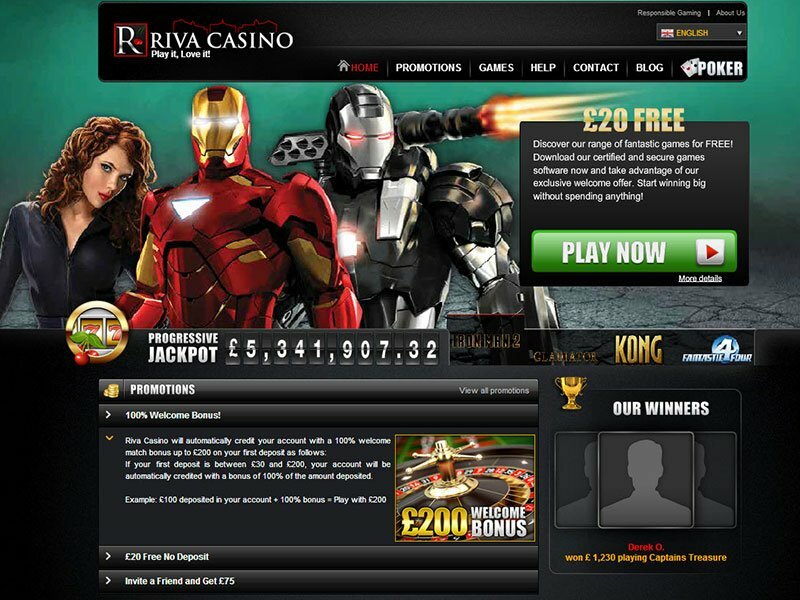 As a new player you can also cash in on a £20 Riva Casino promotion without making a deposit at all. Besides these two options however, Riva Casino bonuses are near non-existent. If you want to keep getting new benefits, you’re going to have to put in the playing time and energy to become a loyal customer at the Riva Casino VIP Players Club where new bonuses and promotions are always on display. Riva Casino offers all of the biggest and most popular payment methods to accommodate all types of customers. At the time of this Riva Casino review, the brand is available for play in 10 different languages and they’ve made sure that this wide range of customers will have the ability to deposit and withdraw funds simply and safely during game play. Unfortunately banking limits and laws mean that Casino Riva is currently unavailable in the U.S. but laws are changing quickly and any online casino with the right opportunity would love to get into the massive American market. Casino Riva sustains 24/7 customer service in 10 different language. Their site features a comfortable contact form for any questions or inquiries, but if you feel more comfortable speaking directly to a professional representative, you can also pick up the telephone and call their customer service offices. They also keep up with the times with a customer service email and live chat available on their site of through the downloadable software.